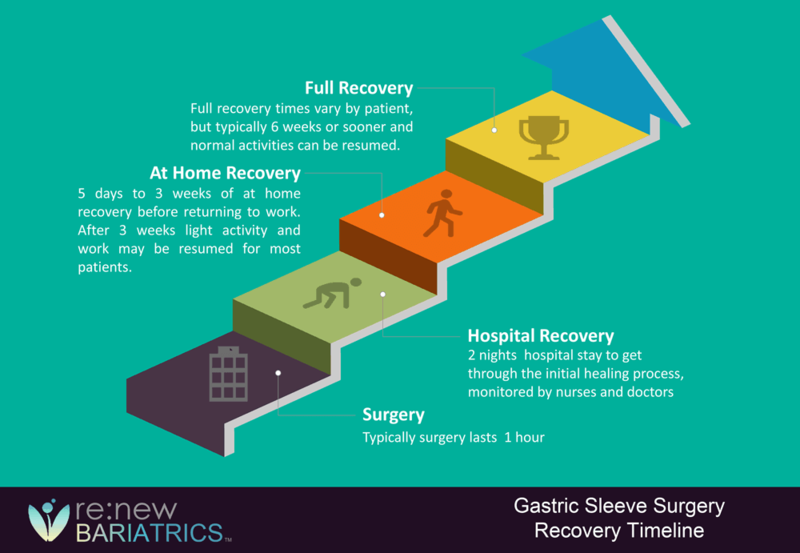 Recovery time after gastric sleeve surgery differs from one patient to the other. Factors that determine recovery time post-surgery includes any conditions, the patient’s body natural response, the preoperative morbid condition of the patient, and the occurrence of any intraoperative complications. The first phase of recovery is to come out of anesthesia. Bariatric surgery is commonly performed under general anesthesia with volatile anesthetics and neuromuscular blockade. However, general anesthesia with neuromuscular blockade increases upper airway collapse risk, pulmonary atelectasis, and postoperative pulmonary complications in this population (Hung, Chen, Shih, & Hung, 2015). At the end of the procedure, the general anesthesia is reversed, and the patient becomes conscious and aware of his/her environment. Morbid obesity itself can delay recovery from anesthesia as the fats store a significant amount of the anesthetic agent that may continue to act after the procedure is completed. The recommendation, based on current practice amongst experts in bariatric anesthesia, is that lean or adjusted body weight are used as the scalars for calculating initial anesthetic drug doses rather than total body weight (Peri-operative management of the obese surgical patient 2015 – – 2015 – Anesthesia – Wiley Online Library,” 2015). There are also cardiovascular, respiratory and hormonal comorbid conditions associated with obesity which may interfere with recovery from anesthetic effect. Nevertheless, in the hands of a qualified anesthetist, recovery from anesthesia should be immediate after gastric sleeve surgery. Following recovery from anesthesia, the other major issue is a pain. Pain usually originates from the sites of incisions (port sites). The most significant port causes the highest pain because it is the incision made to allow removal of the resected part of the stomach. During the procedure, this most considerable incision is stretched to provide adequate space for the resected part of the stomach. This pain can be efficiently managed by sufficient analgesia to ensure a pain-free post-operative period. Initially, the analgesics will be parenteral before converting them to oral once you start taking orally. When Do I Get Discharged from the Hospital? For the first 24-hours post gastric sleeve patients are kept in the hospital. During this period the vital signs such as pulse rate, blood pressure, respiratory rate, oxygen saturation, etc. are regularly monitored to ensure stable hemodynamic and respiratory status. The doctors will also watch out for any early postoperative complication. In the absence of complications, patients are usually discharged after 48 hours of laparoscopic gastric sleeve surgery. Oral intake usually starts after the bowel function has been restored and leakage from staple line has been ruled out. Restoration of bowel function is evidenced by passage of flatus, the presence of normoactive bowel sounds, and absence of abdominal distension. However, when oral intake is finally commenced, you can start with sips of water followed by liquid diet, and subsequently move on to semi-solid foods. All these depend on your doctor’s advice. When Will I Resume Physical Activity? Early ambulation or walking is an essential means of preventing deep vein thrombosis which is common in obese patient post-surgery. Your doctor may allow you to walk (ambulate) after the first few hours of surgery. Activity will resume gradually. Your stomach has been reduced, and you may begin to feel exhausted following little action. Thus, you should limit yourself to mild walking around the house, and little non-exhaustive housework. Further exercise will depend on your fitness level as assessed by your doctor. Four weeks after your surgery, your doctor may allow you do some low impact aerobic exercises. When Will I Get Back To Work? Returning to work vary from one individual to the other as recovery from surgery is not the same for all individual. You may be able to get back to work after one-week post-laparoscopic gastric sleeve if your job is not the high energy demanding type. However, it may take some people up to 3 weeks post-surgery to entirely get back to work. Typically recovery time will be between 2 to 6 weeks. With most people able to get back to work in 2 weeks. It is of great importance that you adhere to your doctor’s advice and instructions as regard diet, drugs, and physical activity following gastric sleeve surgery. This will enable you to have a post-operative period that is not adversely eventful. Are you ready to pursue Weight Loss Surgery in México? Starting your journey is easy and quick, talk to our helpful staff today to learn more about your journey.